What is it with the sudden spate of books on the Nehru-Gandhi family, anyway? First there was Nayantara Sahgal's book on Indira Gandhi. Then Vinod Mehta's The Sanjay Story was re-published. The latest of these books is Tavleen Singh's Durbar. 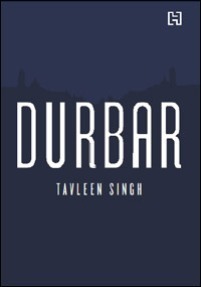 Durbar, of course, refers to the royal court in Delhi - the dynastic Nehru-Gandhi family. In the unlikely event of the Congress being able to cobble together a majority in 2014, Rahul Gandhi will be the fourth person from the family to become Prime Minister of the largest democracy in the world. The book begins with the Emergency Mrs Indira Gandhi imposed in 1975, and takes the reader in brutal detail through the tragic events that followed, all the way till Rajiv Gandhi's assassination. It was a bleak time for India - in some ways the trough before the post-1991 crest. I couldn't help but think of the horrible ends that awaited most of the people I was reading about - Indira Gandhi and Rajiv Gandhi were assassinated, Sanjay Gandhi died in a plane crash, Madhav Rao Scindia died in a helicopter crash. If I were Rahul Gandhi and if I were superstitious, I would run as far away from politics as possible. The events described in the book won't be anything new for a reader who knows modern Indian history. But three things give it an extra jazz - the author's familiarity with the high society in which Rajiv and Sonia Gandhi moved before he became Prime Minister, the often insane risks the author was willing to take to get her stories as a political journalist, and her identity as a Sikh which gave her unique insights into the events of the first half of the eighties. But the book isn't quite what you would expect from a well-known political journalist. It's very gossipy for a start - tales of high society parties and in-groups form the backdrop for the important political events of the day. I was struck by how insular and incestuous Delhi high society is - if you know the right person, you can get anything done. The rest of India barely exists for these people. Most of the names that the author casually drops are now important people politically. Somewhere in the middle of the book, the author quotes Sonia Gandhi as having said something to the effect of, "I would rather let my children beg in the streets than enter politics." Hilarious, when you consider what happened later. The book implies that the Nehru-Gandhi family is to blame for the dynastic tendencies that have crept into pretty much every other party in the country. That there is now a sense of entitlement in our ruling classes - a feeling that they have the right to rob the country of all its riches, even as the people starve. True, of course. And yet, who can we replace them with? I put down the book with a sense of helplessness. Are these the sort of people India deserves? Our choice in 2014 is likely to be between a foreign-educated half-Italian man (whose only qualification is that he is the son, grandson and great grandson of former Prime Ministers of India) and an autocratic, pro-capitalism, anti-Muslim PR specialist who frankly scares the living daylights out of me.